Super AMart were kind enough to gift me the beds, stools, storage and lamps for this room makeover. This is not s sponsored post otherwise. Images by Pixelgarden Design. When you have two very different personalities sharing one space, it can be tricky to style it without it looking like a hot mess. They key is to find things that are similar and make them a feature. By choosing some good solid basics, then doubling them, I set the foundation for their personalities to shine through, while still giving the room a feeling of cohesion. The space in this room allowed me to butterfly the furniture – a mirror image for each child’s side. That might not always be possible, but by keeping your main furniture items the same you will still see that cohesion happening. Even though both sides of this room look quite different, there is still that sense of cohesion – the trick is colour. By choosing some common colours to feature throughout you can achieve a sense of flow. Grey/Silver: On Cael’s side you can find this in the sheets, wall decals, the printable and the arrow. On Ivy’s it pops up in the linen, and on the X pillow. Turquoise: The turquoise on the wall makes an appearance on both sides of the room. For Cael you can see it in the fox-basket, and for Ivy it is on the linen, the throw and in shades of the wall decal. While both doona covers are different, the fact that they are both white and both feature a recurring geometric pattern in a similar size means that they work together. The end result is a couple of kids who love their new space and are happy to share. 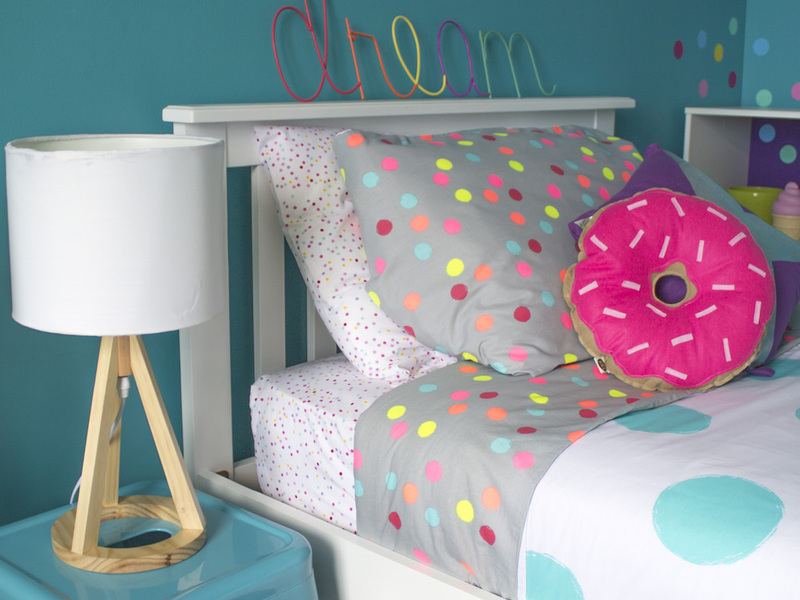 Want more tips on styling a kid’s room? Head over to Super Amart for more tips PLUS your cahnce to win a $1000 room makeover! You’ve done an awesome job, so fresh and fun!